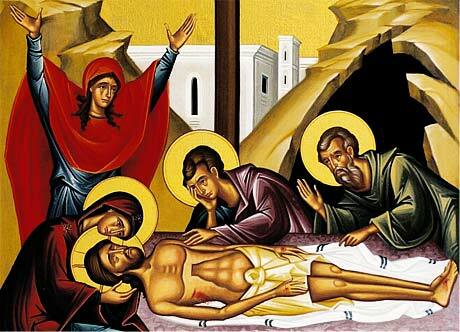 "Come, let us see our Life lying in the tomb, that He may give life to those that in their tombs lie dead. Come, let us look today on the Son of Judah as He sleeps, and with the prophet let us cry aloud to Him: Thou hast lain down, Thou hast slept as a lion; who shall awaken Thee, O King? But of Thine own free will do Thou rise up, who willingly dost give Thyself for us. O Lord, glory to Thee." "Today a tomb holds Him who holds the creation in the hollow of His hand; a stone covers Him who covered the heavens with glory. Life sleeps and hell trembles, and Adam is set free from his bonds. Glory to Thy dispensation, whereby Thou hast accomplished all things, granting us an eternal Sabbath, Thy most holy Resurrection from the dead."